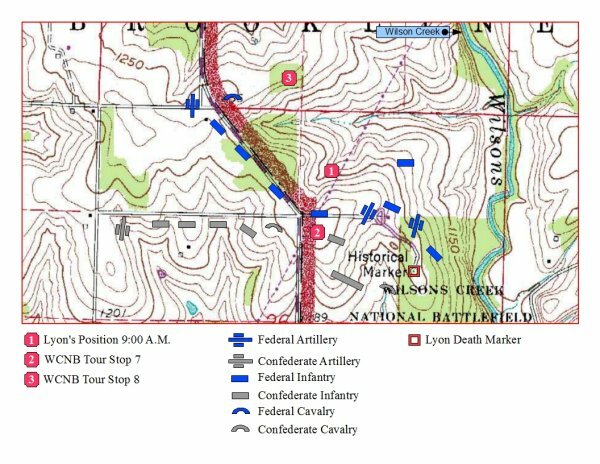 Description: Union Brigadier General Nathaniel Lyon's initial attack had caught the Confederates by surprise and by 6:00 A.M. the Federals had reached the top of Bloody Hill. Now Lyon worked to consolidate his forces and planned to continue down the hill after the withdrawing Confederates. Lyon had not heard from Colonel Franz Sigel and was unsure whether he had begun his attack on the Confederate rear. They soon heard artillery fire from the south and believed it to be from Sigel. Lyon decided that Sigel had begun his attack and was being successful. On the far left was the First Iowa Infantry commanded by Lt. Colonel William Merritt. To the right and behind of Merritt was the Du Bois Battery (4 guns) commanded by Lieutenant John Du Bois. Next in line was part of the First Kansas Infantry commanded by Colonel George Deitzler. In the center was Totten's Battery (6 guns) commanded by Captain James Totten. Next in line was the rest of the First Kansas Infantry being led by Major John Halderman. On the far right was the Second Missouri Infantry commanded by Major Peter Osterhaus. Held in reserve was the Second Kansas Infantry commanded by Colonel Robert Mitchell. On the far left was the MSG Seventh Division commanded by Brigadier General James H. McBride. On the far right was what remained of the cavalry commanded by Colonel James Cawthorn. Lyon sent the First Kansas and the First Missouri regiments forward down the hill. Visibility was poor because of the tall prairie grass. Price had his troops wait until the Federals got closer to his lines. 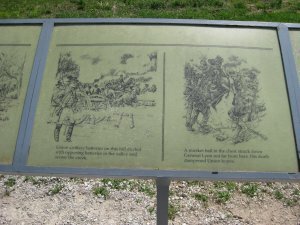 The Missouri State Guard opened fire when the Federals were within shotgun range for that was the weapon used by many of the Missouri State Guard. The Confederates continued moving forward up the hill. They were supported by Guibor's Battery fire as they assaulted the Federal positions on Bloody Hill. Lyon ordered his reserve unit, the Second Kansas Infantry, forward into the line of battle. They took their position just to the left of the First Missouri and began firing on the enemy attackers. The Missouri State Guard withdrew down the hill. The fighting lasted for about an hour and by 7:30 A.M. the Federals had withdrawn back up to their lines at the top of Bloody Hill. 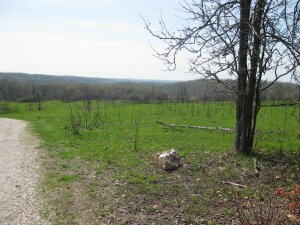 Now the Federals were no longer on the offensive, but would fight the rest of the day from their defenses near the top of Bloody Hill. 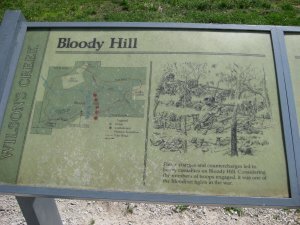 Price was consolidating his Missouri State Guard at the base of the hill and would launch additional attacks up Bloody Hill before the day's fighting would be done. Next in line was battalion of US Regulars commanded by Captain Frederick Steele. Next in line was the First Kansas Infantry being led by Major John Halderman due to Deitzler's earlier wound. Next in line was the Second Kansas Infantry commanded by Colonel Robert Mitchell. Next in line was the Second Missouri Infantry commanded by Major Peter Osterhaus. On the far right was Sokalski's Section of two guns detached from Totten's Battery and led by Lieutenant George Sokalski. Held in reserve were the remnants of Plummer's Battalion now commanded by Captain Arch Houston due to Plummer's earlier wound. On the far left was the Missouri Light Battery (4 guns) commanded by Captain Henry Guibor. Next in line was the MSG Seventh Division commanded by Brigadier General James H. McBride. Shortly after 9:00 A.M. the Missouri State Guard moved up the hill. The defending Federals opened fire. The Union artillery fired cannister that was particularly effective against the attacking enemy. It was during this second assault that Lyon was wounded as he directed the battle. It was a superficial wound to his leg. A little later during this assault, Lyon's horse was killed and then Lyon was wounded a second time, another superficial wound, but this time to his head. Lyon was dazed and moved to the rear. While here he was joined by his chief of staff, Major John Schofield. It was at this point in the battle that Lyon said to Schofield, "Major, I am afraid the day is lost." Schofield reported that he replied, "No, General, let us try it again." Major Sturgis offered Lyon his own horse and Lyon used it to return to the front. He was once again at the front directing the battle for the Federals when he was hit in the chest by a large caliber bullet. Lyon died quickly, becoming the first US General killed during the war. 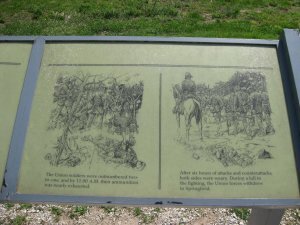 A short time later, the Missouri State Guard units withdrew and there was another lull in the fighting around 10:00 A.M. Major Schofield was informed of Lyon's death and went looking for Major Sturgis to inform him that he was now in command of the Union forces on Bloody Hill. Now that he was in command, Union Major Samuel Sturgis began to assess his situation. He still held the high ground on top of Bloody Hill. But his men were hungry, thirsty and tired. They had not eaten since leaving Springfield, the day was very hot, and they were low on water. Sturgis still had no idea what had become of Sigel's Brigade. The consensus from the other senior officers was to retreat unless Sigel appeared soon. Sturgis decided to hold off on retreat and realigned by moving the Second Missouri under Major Osterhaus from the Union right flank to the left in support of the Du Bois Battery. Major General Sterling Price was preparing for a third assault against the Federals on Bloody Hill. He sent a request for support from Confederate Brigadier General Bart Pearce and his Arkansas troops. Pearce responded and led his forces across to the western side of Wilson's Creek to join Price. 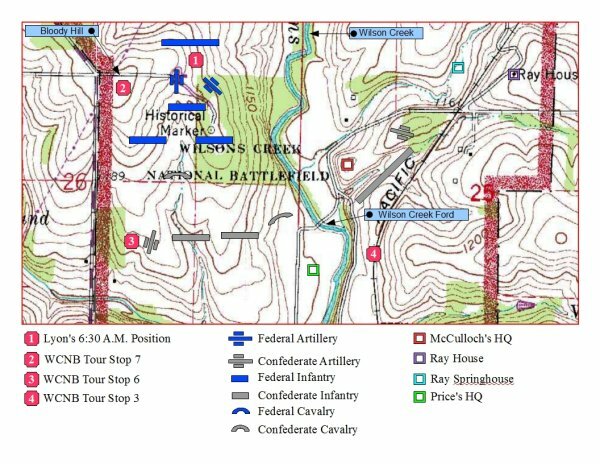 Pearce moved his forces onto he left flank of the Confederate positions. The Confederates began their third assault up Bloody Hill around 10:30 A.M. It was the largest assault yet by the Confederates. Although they had greater numbers of men, the Federals had better weapons and a strong defensive position. The Federals were able to beat back the Confederate assault, but they were running low on ammunition. By 11:30 A.M., the Union commander, Major Sturgis, had had enough and ordered a withdrawal.